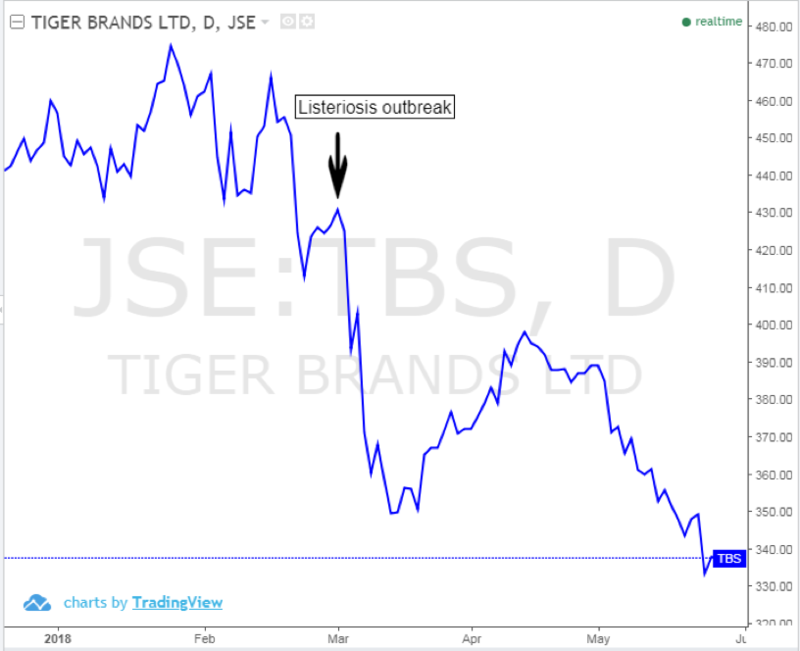 Views - How much has Listeriosis cost Tiger Brands? How much has Listeriosis cost Tiger Brands? Tiger Bands released their results for the last 6 months ending March 2018, last week. The main thing everybody was keeping an eye on was the amount that the Listeriosis outbreak had cost the company so far, and it has been substantial. The outbreak has cost the company R365 million up until now and will cost another R50 million per month going forward. This figure can grow to an even bigger one once insurance claims and potential legal consequences are finalised. It has resulted in the deaths of almost 200 people, while the company is also disposing of 4’000 tonnes of its products connected to the outbreak. The effect of the outbreak is clear. It has also come at a very difficult time as the outlook for the rest of the year remains challenging. Intense competition and continued pressure on pricing has made the operating environment difficult for all companies within the industry. Tiger Brands have still not found the root cause of the outbreak which will be a major concern. It has stated that it is working with regulators on new industry standards in order to avoid similar crisis in future. Stephan heads up Sharenet’s trading desk and is a full-time trader and portfolio analyst, also responsible for equity research across industries. Stephan developed his passion for the markets while working in the Stockbroking division of Standard Bank and is especially passionate about CFD trading. Stephan studied at the University of Stellenbosch and completed a BComm Honours (Business Management) with a focus in Portfolio Management and Bonds. He has also passed the JSE Equity Trader’s Exam, RE5 (Representative) and RE1 (Key individual) Exams as well as the Registered Persons Exams (RPEs) in order to give advice on equities.